5.3 billion mobile subscribers are 77 percent of the world population. Out of 5.3 smartphone users, an estimated 38.5% is powered by Android. For Android GPS users, especially those who use their mobile device for outdoor adventures, a travel app is complementary. Since add-on maps for the 12 US states are now available for BackCountry Navigator PRO, we are featuring Nevada BLM maps for Android today. The origin of the name Nevada is a Spanish word meaning "snowcapped". The state nickname is Silver State or Sagebrush State. The residents names are Nevadans and the major industries are tourism, gold and silver mining and hydroelectric power. The bordering states are Arizona, California, Idaho, Oregon and Utah. BLM public lands make up about 67 percent of Nevada's land base which is nearly 48 million acres of land. The state of Nevada is known for gambling and entertainment, particularly in the city of Las Vegas. However, the state holds a number of other famous attractions for all age groups beyond the casinos, some are even just a short drive from the city. Among some of the most notable attractions in Nevada are a mountain park, a major feat of modern engineering and a historical automobile collection of some of the most desired vehicles in the world. The diversity and beauty of Nevada holds dozens of fishing areas, hundreds of trails, picnic sites and developed and primitive camping opportunities for anyone to explore and enjoy. The Black Rock Desert-High Rock Canyon Emigrant Trails is located approximately 100 miles northeast of Reno. The key area, the BlackRock Desert Playa, contains more than 160,000 acres of the bed of ancient Lake Lahontan. That huge lake covered this area with 500 feet of water as recently as 14,000 years ago. The Black Rock Country provides expansive views, solitude, and a sense of primitive vastness little changed since Euro-Americans settled the West. Red Rock Canyon is located 10 miles west of Las Vegas, Nevada. This 197,000 acre area provides a 13-mile scenic drive, more than 30 miles of hiking trails, picnic areas, and a visitor center with exhibit rooms and a bookstore. The unique geologic features, plants and animals of Red Rock Canyon represent some of the best examples of the Mojave Desert. Red Rock Canyon is enjoyed by the local population as well as by visitors from the United States and many foreign countries. More than one million visitors each year enjoy the spectacular desert landscape, climbing and hiking opportunities. 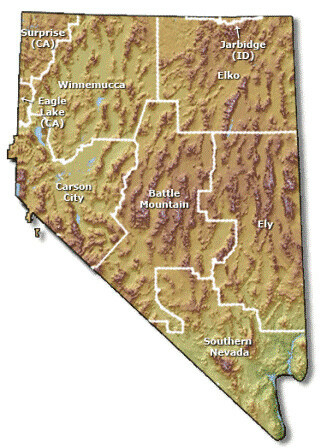 Sloan Canyon is located approximately 15 miles south of Las Vegas. It contains the Northern portion of the McCullough Range, which is volcanic in origin. The peaks are rounded and have a steep Eastern slope and a gradual Western slope. Elevations span from 2,000 feet at the Eastern base of the range to 5,092 feet at Black Mountain. The ridgeline offers excellent views of the Las Vegas valley, numerous ranges and the Eldorado and Jean dry lakes. The area primarily supports a creosote bush community with barrel cactus, Joshua trees, cholla and prickly pear. Perhaps the most attractive place to go to in Nevada because of its history is the famous Hoover Dam, originally called the Boulder Dam. It is an arch-gravity dam, having the characteristics of both an arch dam and a gravity dam. Hoover Dam is located in the Black Canyon on the Colorado River bordering both Nevada and Arizona. Created from concrete and facing upstream, it uses the natural force of the canyon to force the water into the dam. At the time of its completion in 1936, the Hoover Dam claimed its fame as the world's largest structure. Today, it still remains one of the largest hydroelectric power plants in the world. Below is the history of its construction. Nevada, in its diversity, is an overwhelming place. Wherever you choose to explore, use your Android phone with Nevada BLM maps. Nevada BLM maps can be purchased through BackCountry Navigator PRO by going to the "purchase add-on" menu.